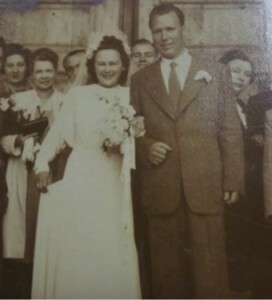 It was fate that bought Nathaniel and Antonia together in 1943. “I was walking past the bus stop when I first saw Antonia. She was with her brother but I did not know that it was her brother. She was staring at me and I was thinking how cheeky she must be to be with another man but still be smiling at me,” Nathaniel laughs. Every Sunday the families of Trieste would go to the local hall where they would eat, dance and socialise. “I was having a great time talking to friends and laughing” Nathaniel remembers. As he moved around the room he saw a familiar face… the girl from the bus stop. “She looked like an angel” Nathaniel describes, “I still remember the dress that she was wearing and the pretty necklace around her neck.” Antonia also remembered who Nathaniel was and smiled at him from across the room. “She was with her brother again who I thought was her boyfriend so I did not want to cause any trouble. I smiled politely at her and kept on moving around the tables to socialise” But Nathaniel couldn’t get her out of his head. He spoke to his brother who knew of Antonia’s family and told him she did not have a boyfriend, that the man she was with was actually her brother. “My heart skipped a beat I was so excited! I wasted no time in going over to her table and introducing myself to her and her family.” Nathaniel asked Antonia to dance and they had a wonderful time together laughing and dancing. After coincidently seeing each other twice in one week, Nathaniel knew that it must have meant to be and so he asked if Antonia would like to go on a date. For the next couple of years the two enjoyed each other’s company, going to the movies, going out dancing or for walks. “One time, when we were first going out, I took her to the movies and her mum made her bring her cousin. I got stuck paying for three tickets instead of two!” Nathaniel joked cheekily. As time passed the two fell more in love and Nathaniel asked Antonia if she would be his wife. After about four years Antonia had lost both of her legs to diabetes and sadly had to move out into a nursing home. “The separation was so hard and the house felt empty and cold,” Nathaniel explained. “I visited Antonia everyday but it was not the same as having her with me at home.” Antonia spent three years in the nursing home where she passed away peacefully in 1999. Nathaniel still lives at home where his daughter takes care of him. This year would be their sixty-eighth year of marriage.